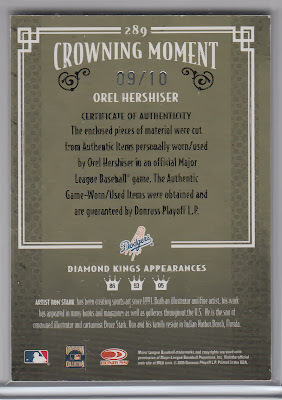 The Diamond Kings autographed cards from 2005 ranks as one of my all-time favorite inserts. 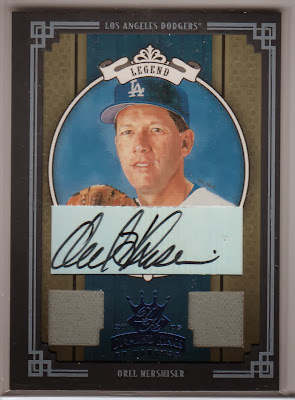 I have 10 different Dodger cards in my collection and this new purchase (shown here) is my 11th different card. 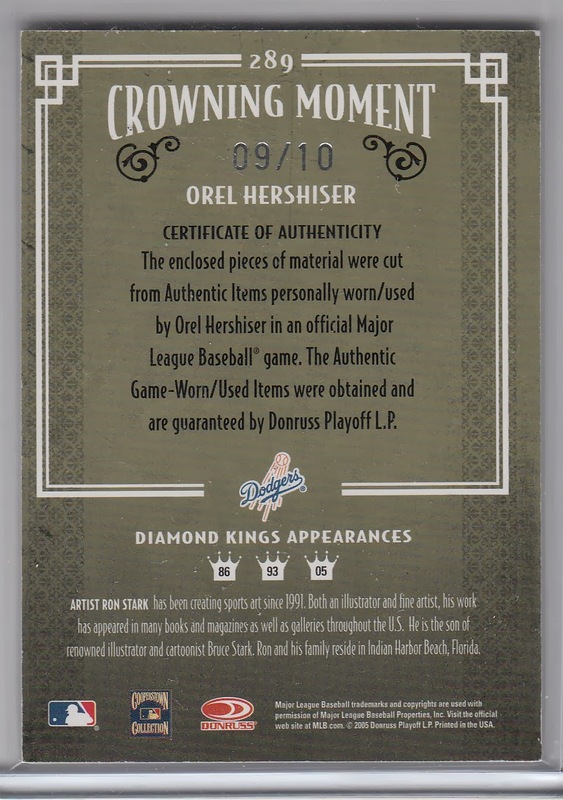 As you can see, it is an autographed Orel Hershiser card with a couple of game-used relic pieces attached. It is also numbered 9 out of 10. I have made several recent purchases, so I'll be sharing them over the next few days. 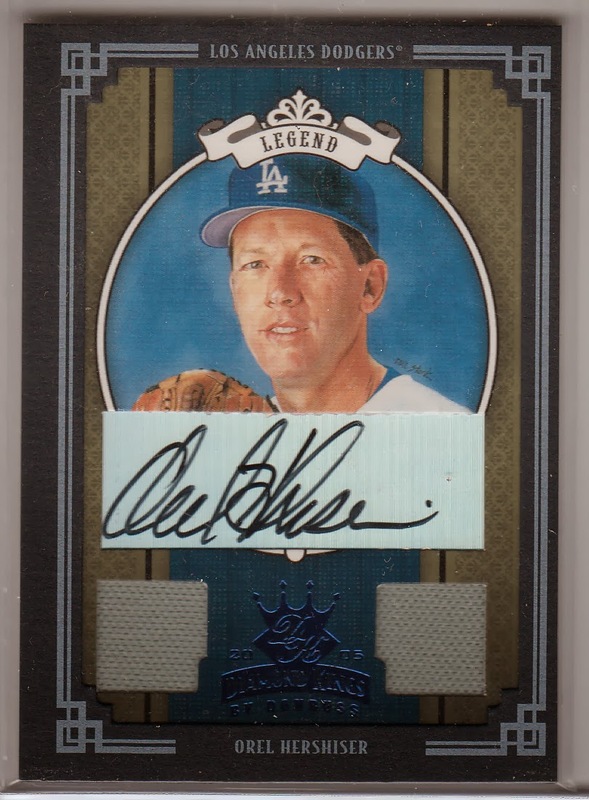 They include mostly autographed cards like this, but there is one surprise vintage Dodger set that I am very excited about sharing. So, stay tuned. The 2014 Sports Memorabilia Auction Season is starting off with a bang. Lelands auction house has their Fall 2014 auction already up and it features one of the more unique and incredible memorabilia items available. Below is the first and original Rookie of the Year Award given to Jackie Robinson. 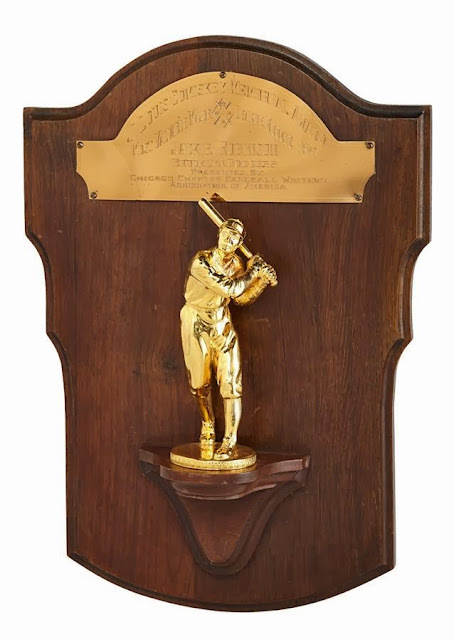 As you may know, this was the first-ever ROY award ever given out and it was a league-wide award; meaning it was for both the American and National Leagues. It is expected that it will sell in the 6-figures range, but exactly how high is anybodies guess. At the time of this posting it is at $80,525.50. 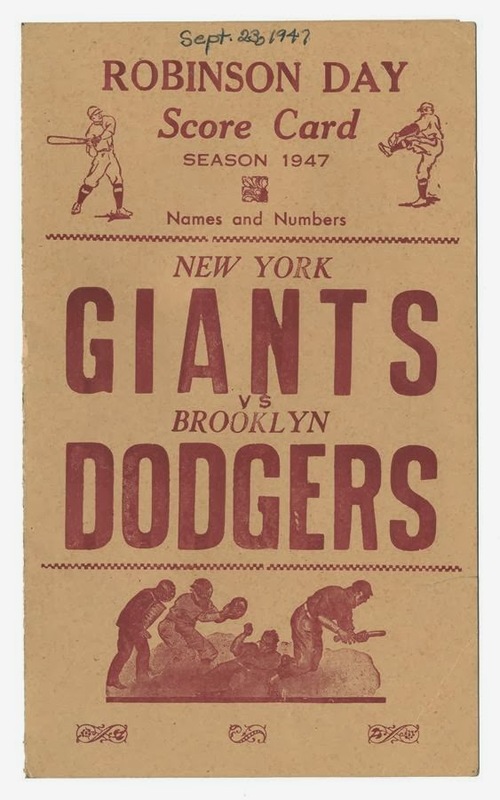 Following up on the Jackie Robinson theme, Lelands also has on auction an original scorecard from Jackie Robinson Day, September 23, 1947. See it below. 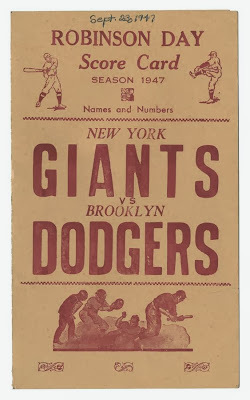 This game was organized by the Brooklyn fans, and featured a showering of gifts onto Jackie and his family. He received a new Cadillac, TV set, radio, cutlery and many other gifts. Also, noted civil rights pioneer and entertainer Bill "Bojangles" Robinson danced on the dugout in Jackie's honor. 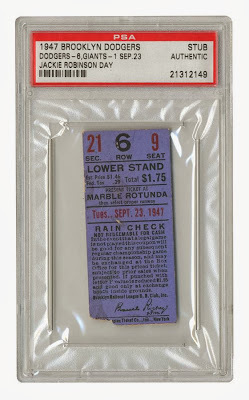 Below is a used ticket stub from Jackie Robinson Day. This New Years is all about Vin Scully and the Rose Parade. As you know, he is the Grand Marshall. In the above pic he is being interviewed by Hannah Storm for ABC, pic via her twitter. Brian Bencomo at Pasadena Magazine shares a Q&A with Vin Scully. The theme of this Rose Parade is “Dreams Come True.” Does that resonate with your life? Oh, absolutely. I mean, I might not really qualify to be a Grand Marshal, but I certainly qualify under “dreams come true,” because I wanted to be a sports announcer when I was eight years old. Now that’s really rare because there were hardly any sports on radio and there was no television. So for a little kid who crawled under a big radio to listen to a college football game, to become a sports announcer and work in the big leagues, oh yes, I’m the embodiment of dream comes true. JP Hoornstra at Inside the Dodgers shares some language from the Puig arrest police report, and it's rather scathing. Based on my training and experience as a Florida Highway Patrol Trooper and due to the high speed that he was traveling and the others Vehicles on the roadway. If Mr. Puig would had loss control of his vehicle or would had suffered a tire failure and crash. His mother and the two passengers would not survived as resulted of his action. Via Dustin Nosler at Feelin' Kinda Blue, "Dee Gordon could get one final shot to be a valuable player with the Dodgers". Via Rob Neyer at Baseball Nation, the Dodgers were the best at shutting down the running game in 2013, and he wonders how important is it really. Via David Seideman at Forbes, "Top 10 Treasure Hunting Tips For Cool Sports Memorabilia". Check out the Breaking Bad comic online, right here.